Grasp the oyster and insert the oyster knife in the point between the two valves, about two thirds down the length of the shell, and cut the muscle that holds it shut. Once you’ve done that, it will be easier to slide the knife around the whole shell and open it completely. Be careful not to injure yourself and at the same time not to over-damage the shell. Filter the water inside the oysters and set it aside. In a frying pan, crush the previously de-salted anchovy fillets to a paste in the oil, add the chopped capers, ideally Pantelleria capers, having previously rinsed off the excess salt, then add the crushed or finely chopped garlic. 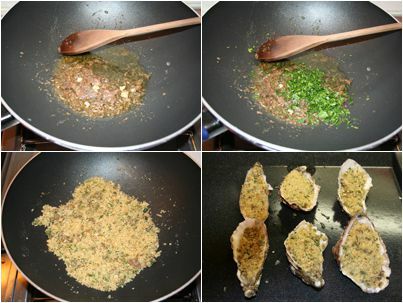 Add the breadcrumbs and allow to brown, add salt and pepper and the water from the oysters; if the mix is too dry, add a little oil or warm water until it has a creamy texture. Put a couple of teaspoonfuls of the breadcrumb mix on top of each oyster then lay them out on a baking tray and place under the pre-heated oven grill for 5 minutes or just long enough to gratin the breadcrumbs perfectly. Remove from the oven and serve immediately.